Buzzers, bells, and the chance to beat that high score from 20 years ago lure arcade enthusiasts to the Asheville Pinball Museum. Before telling you whether I actually scored a goal in the Ice Fever pinball game (circa 1985, only 1,585 ever made), I should explain why I was in the Asheville Pinball Museum in the first place. One of the daunting things about getting old is how quietly stuff — your stuff — becomes outdated and obsolete and, most of all, forgotten. Take phone booths. They don’t really exist anymore except as photo props in London. This hit me hard recently when, as a family, we watched the old Christopher Reeve Superman movie. There’s a little joke in the movie — a killer joke when I was young — where Clark Kent is looking for a phone booth to change in, and he comes upon one of those newfangled 1970s half phone booths without a door. He grimaces and searches for another place to become Superman. I remember the theater when I first saw it: screams of laughter. To my daughters, 10 and 13, this joke might as well have been a Sanskrit retelling of the fable “Of Crows and Owls.” They got absolutely none of it. They didn’t get that Superman used to change in phone booths. They didn’t get why there were new phone booths. They didn’t even get the basic concept of phone booths. To them, the time before cell phones is a time before understanding. There is too much stuff like that, stuff that was such a big part of my life, stuff that I expected would last forever — Saturday morning cartoons, taping songs off the radio, video stores, electric football, actual paper letters that came in mailboxes. That stuff, to my daughters, isn’t just gone, but ancient and silly and lost in the dumpster of pointless history. All of which is a way of saying: My daughters had never played pinball. And something had to be done about that. Pinball, as you might know, was illegal in America for years. The reasons for this now seem hopelessly turn-of-the-century naïve, like something out of The Music Man. But the ban lasted a long time, well into the 1970s. In New York City, G-men would take axes and destroy the machines in actual pinball raids. Even when I began playing, there was still a whiff of danger about pinball machines. It took a writer and pinball machine designer named Roger Sharpe to change things; Sharpe famously played pinball before the New York City Council in 1976 to prove that it was a game of skill. The turning point happened when he predicted and then made a remarkable shot, pulling the plunger and dropping the ball into the middle alley. 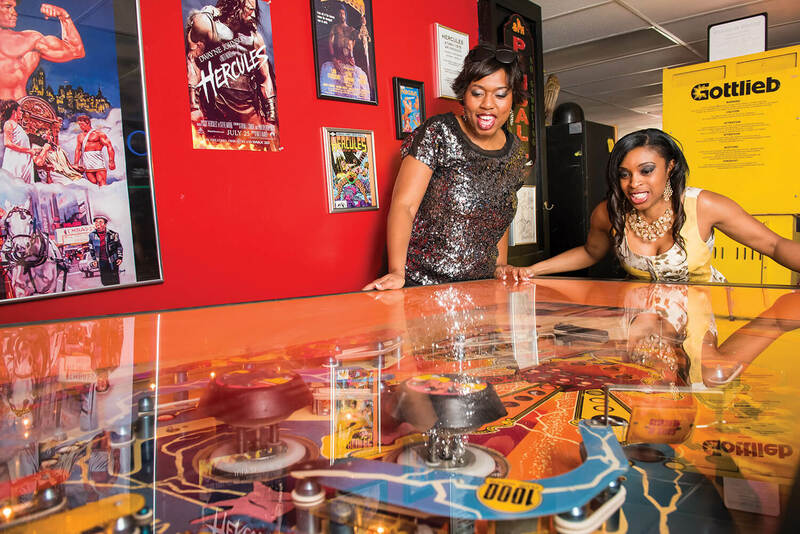 This shot — somewhat bizarrely — convinced the council to legalize pinball machines in New York. Subsequently, they were legalized almost everywhere else. To be clear, I learned exactly zero of these pinball facts at the Asheville Pinball Museum. It’s not that kind of museum. Instead, it’s a walk into childhood. 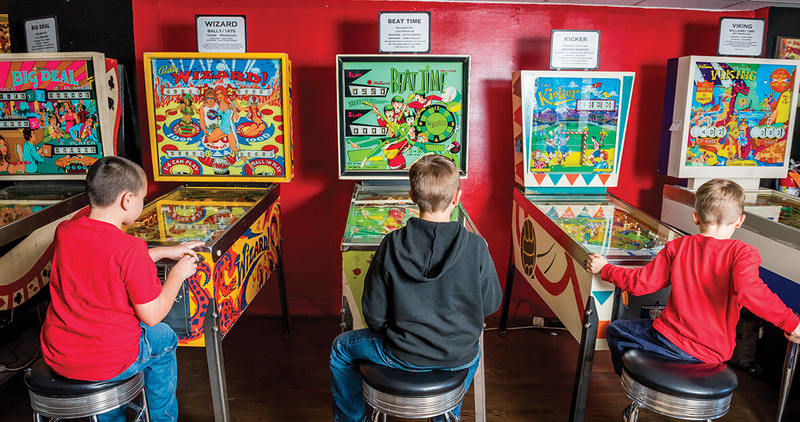 For $12, you can play every one of the 30 pinball machines all day long. DiBella was a middle school social studies and science teacher for 22 years in North Carolina, and he grew up at the arcades just like I did. For fun, he had three pinball machines at his house; they always made people happy at parties. 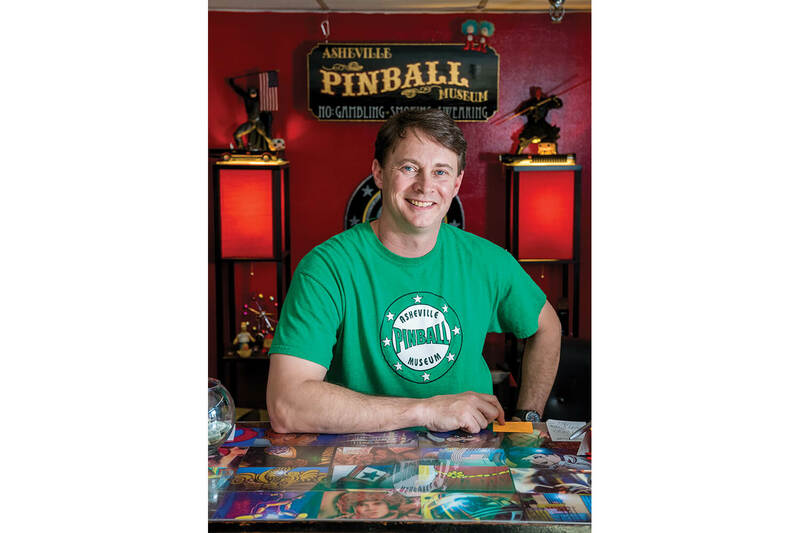 One day, when the politics of education overshadowed the joy he found in being a teacher, he opened his Pinball Museum in downtown Asheville. It makes him happy. He likes to wander around the room, free up balls that get stuck, show people hidden tricks for each machine, and see the way people’s eyes widen when they see pinball machines they played as children. This is why I’m drawn to the Ice Fever pinball game, a hockey pinball game from my time. Though I’ve probably never played this exact machine before, I’ve played a thousand others just like it. There are much cooler pinball machines here in the museum. There are a few old ones from the 1960s. There’s an Addams Family model that is, by most measures, the most popular pinball machine of all time. There are machines for every science fiction story ever told — Star Wars, Star Trek, Terminator 2, Judge Dredd — and there is a Beat Time machine that is a blatant Beatles rip-off. There’s Hitter’s Rally, a baseball pitcher-hitter pinball machine that I personally kept in business with just about every quarter I ever made from my paper route. And there is Hercules, a pinball machine so massive my daughters have to play it in tandem because individually they cannot stretch out wide enough to reach buttons for both flippers. The ball in Hercules is a cue ball from a pool table. But Ice Fever is the game I settle on because it has one particularly cool feature: a pinball lodged in the upper left-hand corner. If you hit this pinball just right, you score a goal and — DiBella promises — the machine lights up in a special way. He makes this special lighting sound like it will be more spectacular than the fireworks show they had at the Beijing Olympics. At first, I admit, scoring a goal in Ice Fever is just a lark. It doesn’t really matter to me. The whole point of this adventure is to introduce the girls to pinball, and they love it. Elizabeth and Katie run around the museum happily, jumping with my wife, Margo, from a pinball machine that shoots 10 pinballs at you at once to The Flintstones machine to the Twilight Zone machine. They also play a few of the video games I used to play obsessively, like Galaga and Ms. Pac Man (it was always Ms. Pac Man for me; she was far superior to her less athletic husband … and she followed her own path even after they were married). After a while, though, I start to forget about the girls. Scoring that goal begins to obsess me. I clear the targets, take the shot, and — OH! — just miss. The game ends. I play again, clear the targets, take the shot, and — OH! — are you kidding me? That was a perfect hit. The machine must be broken. I play again. I play again. I play again. The girls come by and ask me to play another game with them. I tell them I will, in a minute. But I do not. I have to score this goal. DiBella walks over to offer a helpful tip or two. I clear the targets one more time. “OK, now let’s see you hit the target,” he says. I hold my right flipper steady. Everyone disappears. Time stops. I see the girl in braces, and I hear the melodic cacophony of pinball machines jingling, and I unleash the shot. It hits the pinball on the nose, sending it shooting up the tube and into the goal. “Goal!” I shout, probably too loudly, and DiBella pats me on the back like I’ve actually just scored a goal in the Stanley Cup Finals. I look at him as if awakened from a dream. I pause and think of the right thing to say.